Nitto NT 555R II Extreme tires are built for maximum performance both on the street or on the road course. This street legal tire features a drag radial tread design that provides incredible traction and grip on all road surfaces. On the street, wet road traction is enhanced with lateral slits in the tread to go with slanted grooves. The use of steel inserts in the sidewall of this tire gives it excellent high speed cornering and responsiveness. The tire casing has twin steel belts with nylon cap plies, and jointless bead construction for better stability and control at any speeds. Prices on the Nitto NT 555R II tires range from around $150 for the smallest 17 inch series, to upwards of $500+ for the massive 22 inch series tires. Who Are Nitto NT 555R II Extreme Tires Designed For? Nitto has designed the NT 555R II Extreme tires for drivers of sports coupes and sedans who are looking for a street legal racing tire road course use, and one that can also be driven in daily use around town. 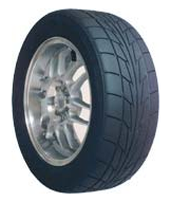 Nitto tires provides a guarantee against materials and workmanship for a period of 5 years. It includes free tire replacement for the first 25% of tread depth, followed by a prorated amount down to the last 2/32 inch of useable tread depth. There is no mileage warranty provided for tread wear on these tires.